Russian President Vladimir Putin said the return of Crimea to Russia in March 2014 was not the purpose of the Russian administration. "The end goal was to enable people to express their opinion on how they want to live […] I thought to myself: if the people want it, it means it should happen. I means they will have more autonomy, some rights, but as part of the Ukrainian state. Let it be this way then. But if they want something different, then we can't abandon them. We know the outcome of the referendum, and we did what we had to do," Putin said in an interview a piece of which was shown in the announcement of the film "Crimea - Return to the Motherland" aired on Rossiya 1 television. The Russian president said the question about the future of Crimea arose in the early hours of February 23, 2014, when the operation to rescue Ukrainian President Viktor Yanukovych was conducted. "We finished around 7:00 a.m. When we were saying goodbye to each other, I will not hide it, I told all of my colleagues, and there were four of them: 'The situation in Ukraine is such that we have to begin the work on returning Crimea to Russia. Because we can't leave this territory and the people who live there to their own devices, to the nationalists.' I set specific tasks and I said what we should do and how we should do it, but I immediately reiterated that we will only do it if we are absolutely confident that the people who live in Crimea want it," Putin said. 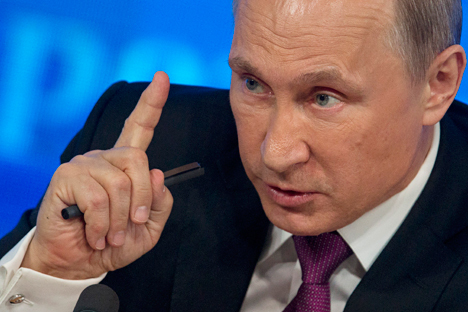 Putin said the opinion of residents of Crimea was studied in a secret poll. "It turned out that 75 percent of the population [of Crimea] wanted to join Russia. A secret poll was conducted, without containing the possibility of joining [Russia]. It became obvious to me that, if we came to that, the level or number of those people who would like that historical event to happen would be much higher," Putin said.